You may recall my post a while back where I shared my Disney princess party shopping trip and then there is my G+ photo album of our whole trip. 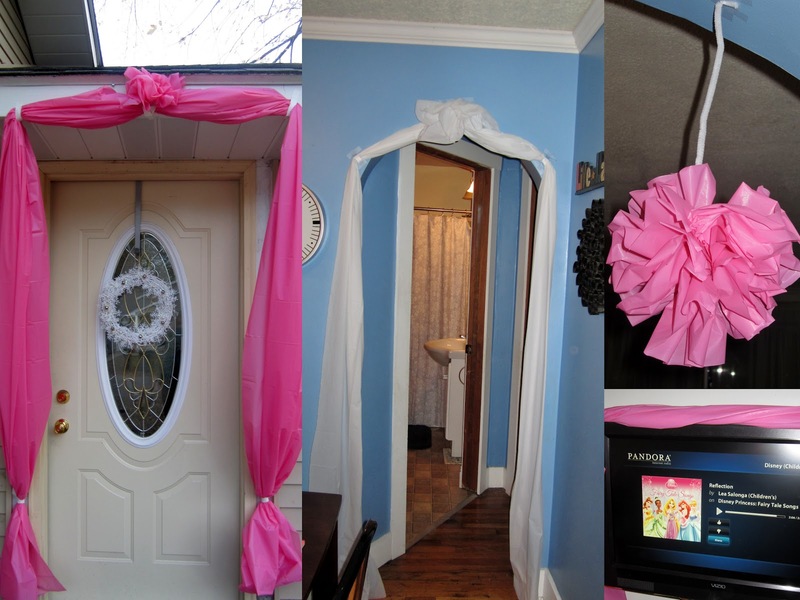 Since then my daughter and I have been dreaming up creative party ideas and preparing our modest home for our big event. I even started a couple of Pinterest boards to help me find ideas. Nothing ever turns out quite like I envision it but I think we laid out a beautiful spread. I covered the table in a white tablecloth and some pink sparkle tissue paper. I own a nice cupcake tower so I loaded it up with goodies including my own special homemade rice crispy treats. Adding the white chocolate and dried berries on the top makes normal rice crispy treats out of this world! I cut up some fresh vegetables and laid those out on a pretty pink tray. My daughter really wanted pink lemonade so I put that out to drink. Once we got the favor bags added to the table we stepped back. My daughter hugged me and told me I was the best mom ever. It's moments like those that I love! 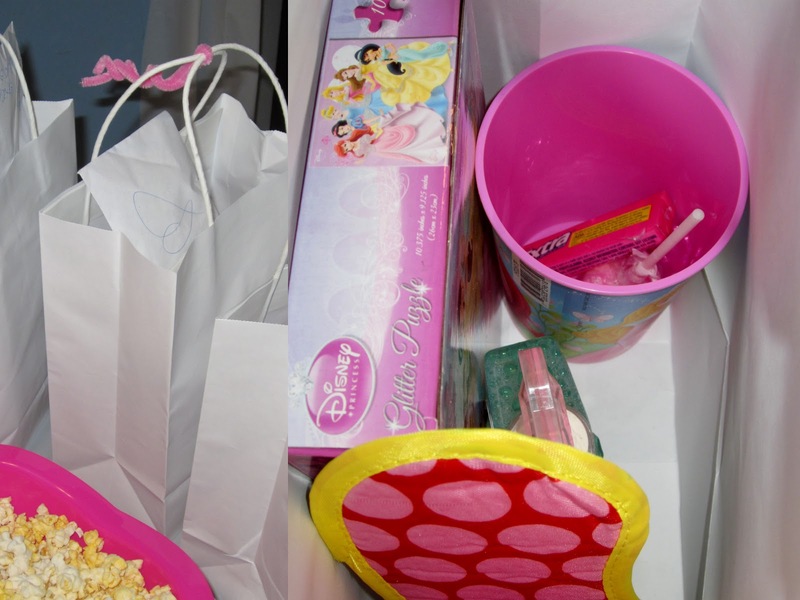 We filled our gift bags up with Disney princess puzzles, Disney princess perfume bubbles, Disney princess plastic cups, bubble gum, bubble gum lollipop, a plastic princess ring and an eye mask for beauty sleep. The bags looked awesome! I had my husband take my boys out for the evening so that we could have a girls only evening. 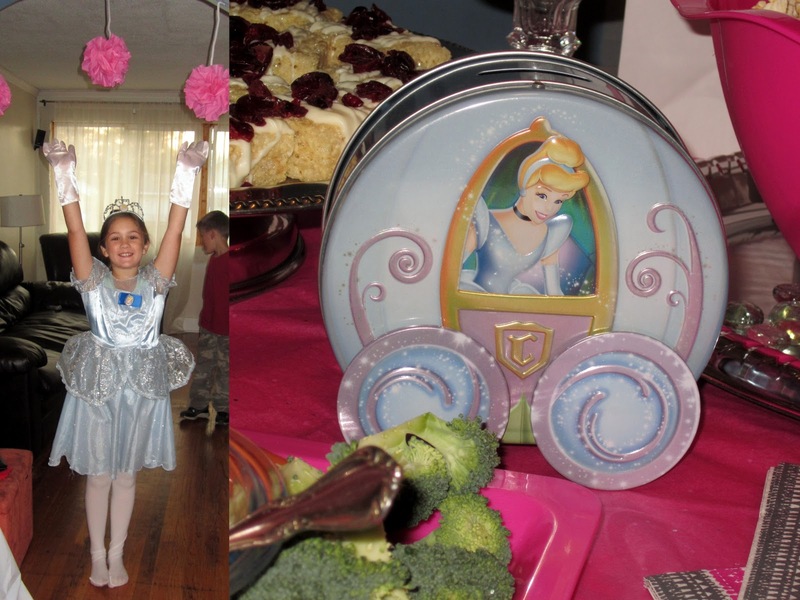 My daughter was SO excited as she danced around in her Cinderella costume, waiting for her guests to arrive. I used a lot of plastic tablecloths as decoration around my home as you will see in my photos. They were the easiest and most cost efficient way to create the dramatic effect we wanted. Plastic tablecloth even makes amazing party poofs! I just used some white duck tape and we were good to go. I did have a castle made out of cardboard boxes that I was going to put outside my front door. Unfortunately the rain kept on coming and going which ruined that idea. I decided to just add a couple billows of pink plastic table cloth instead. We cranked up the Disney tunes on Pandora internet radio to help us get into the party mood as we welcomed our special princess guests inside. 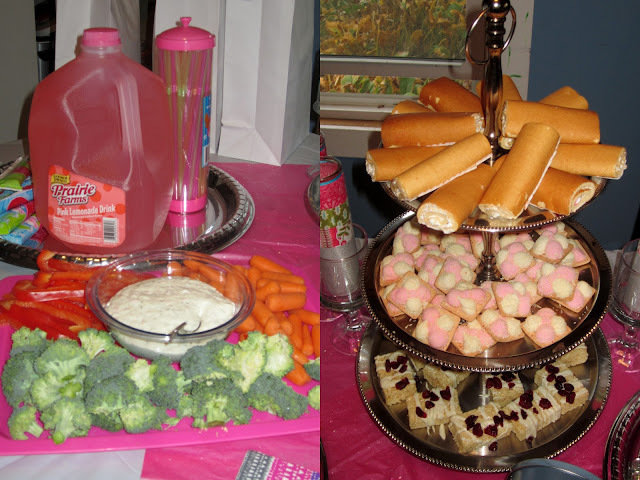 Once our special guests arrived I had them head to the snack table and load up some plates. We were going to watch the Tangled short movie on the new Disney Blu-Ray/DVD combo pack I had purchased. The girls giggled and laughed throughout the whole short movie! I thought that the short was really funny too. I held a small intermission while the girls refreshed their beverages and then we started Cinderella the movie. It looked amazing on Blu-Ray and the sound was outstanding! 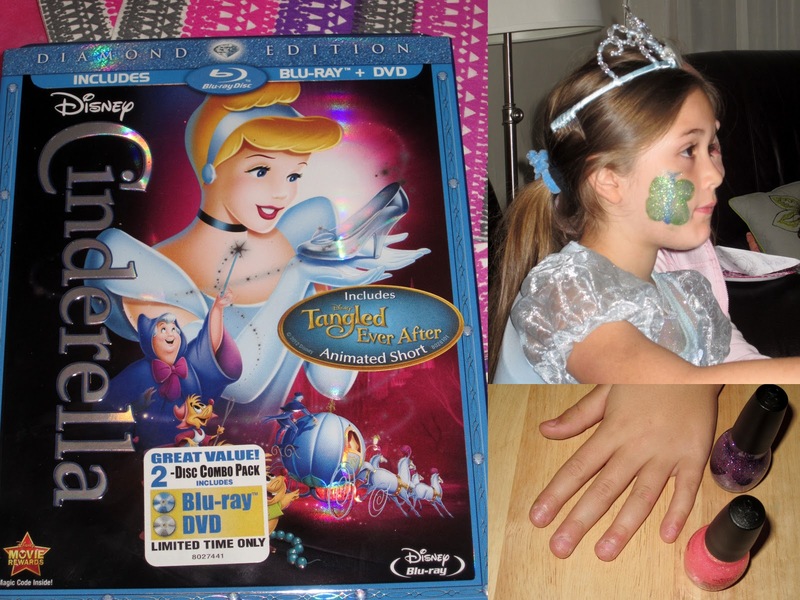 While the girlies watched the movie I had them take turns for face painting and sparkle nail polish. About 1/2 way through the movie we paused it and went to the table I had cleaned off. That plastic tablecloth was about to come in handy. I had prepared a little craft for each of the girls. Each girl would each paint a heart shaped picture frame that I had found at Walmart. We used glow in the dark paint as well as sparkle paint. I even had some Disney princess stickers for them to add in. 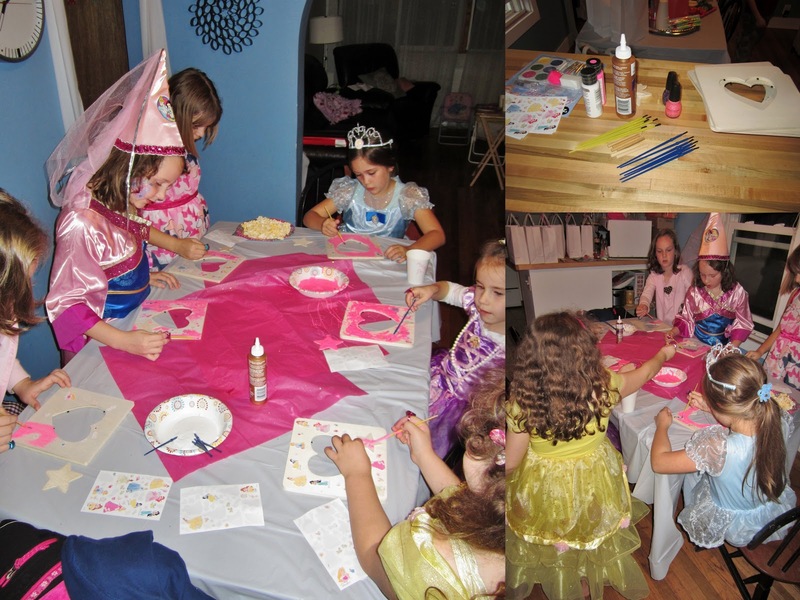 The girls really enjoyed painting and it gave me a moment to take some photos with the Disney Royal Ball AR app 2.0 on my Android phone. The app can be found by searching ‘Royal Ball’ in the iTunes App Store or Google Play store. I loaded up the app and went straight to the Princess Boutique to find the dress that the girls wanted for their pictures. I took each girl's photo and uploaded them to my flickr account so I could view and print them. I had planned to print them all out so the girls could use the photo inside their frame they were painting. Once we finished painting everybody washed up and we went back to movie watching. As the movie was finishing up their frames were drying. Before the parents would begin arriving I rounded the girls up for one last group picture. A couple of the girls did not have Disney princess costumes and I was disappointed for them that I didn't have extras to loan out. The girls all still loved the party and it wasn't a big deal. Everyone told me that our party was the most fun, the best they'd ever been to! Next time I will be sure to have a couple extra costumes on hand. Walmart had a low cost Cinderella version for under $10. We had SO much fun at our Disney Princess Halloween party. 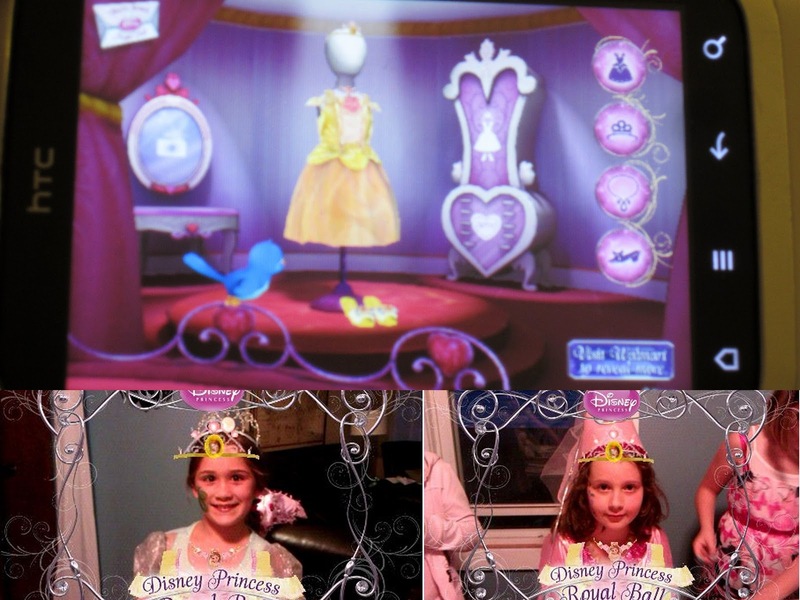 I hope you will check out the Royal Ball Augmented Reality 2.0 app, it was a blast for the girls! I am a member of the Collective Bias™ Social Fabric® Community. This shop has been compensated as part of a social shopper insights study for Collective Bias™ and Disney Consumer Products, Inc. #CBias #SocialFabric. All opinions are 100% my own.